An aerial view of the "Bungalow Garden" at the heart of the Southern Area, taken in 2004. Welcome to the Design Our Space website. persuaded South Hams District Council to withdraw its plan for the Southern Area of Totnes. conducted a Community Planning Process which resulted in a widely approved development plan. presented the plan to SHDC, which approved it in November 2004.
continued to work with SHDC and local architects Harrison Sutton to produce detailed plans for Phase 1.
worked with SHDC and Charlotte Rathbone of the Rathbone Partnership to develop plans for the "Bungalow Garden", now known as the Leechwell Garden. In July 2006, the DOS constitution was modified slightly. 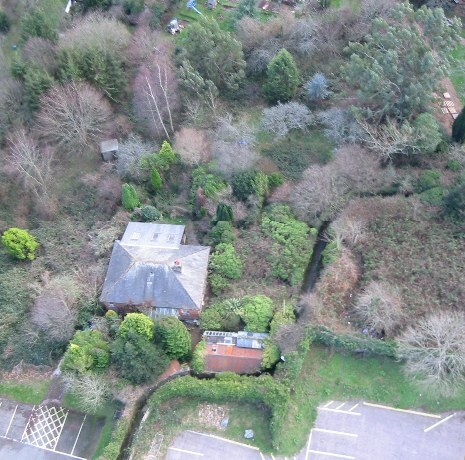 Our primary objective became "to monitor continuing development of the Southern Area of Totnes and promote development of its open space"
In January 2009, the Leechwell Garden Association (LGA) was formed and the remaining DOS funds were transferred to it. For the moment, the LGA's objectives are in essence those of DOS, and as a result DOS has ceased to play an active role. You can find out much more information about the LGA on its website. Some pictures of the Bungalow Garden, taken in March 2005 after it had first been cleared, are here. Most of the old DOS web-site is still available here.